Last week I gazed at the Polar Pathway and other twinkling sights in Christmas Town instead of decorating my own home for the holiday season. A few days ago I finally dragged the boxes full of holiday decorations out of the attic. The tree skirt and matching stockings were nowhere to be found amidst the tangle of colored lights, glittery snowflakes and ball ornaments. Which meant the Ogre had to tackle our garage for the misfit box. Fortunately he did rescue it, but not before I flickered toward Etsy in curiosity. 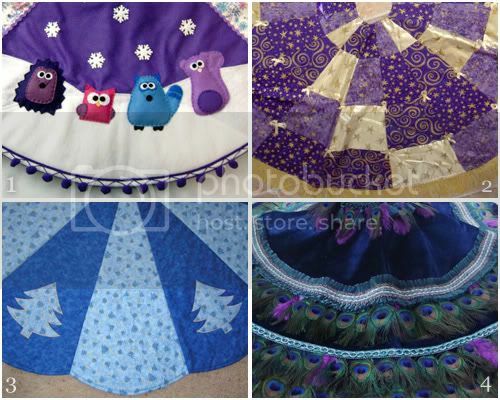 Many handmade sellers have been busy sewing unique Christmas tree skirts in their workshops! Any of these would make a merry place for presents to rest. Aww, that first one is so cute!! These are awesome! We have a plain one from Target but how fun to have a fancy one. I love purple so these are right up my alley! Great finds!